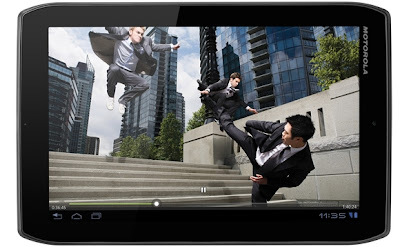 The Motorola Xoom 2 available on price tag of £380 in UK is worth noticing. With a weight of approximately 599 gram it is well compared with the weight of iPad 2 (601g). Slimmer 8.8 mm it is exactly the thickness of iPad 2. The corners of the Xoom 2 have an angular curve that makes it easier to hold the tablet. The only external buttons to Xoom 2 are a volume rocker and the power switch. At its top there is provided a 3.5mm headphone jack and on the bottom there are micro USB and mini HDMI ports. The 10.1-inch screen is a bit more improvement over the original Xoom. Colours are vibrant, making photos and videos to appear huge and impressive. It provides a very wide and elaborate viewing angle. The screen made from Gorilla Glass is quite scratch resistant. In hardware it has a 1.2GHz dual-core processor with 1GB of RAM. There's about 16GB of storage. It has no option to increase the storage as this version has not option for a microSD card. The camera in the phone is in the centre of the tablet irrespective of on the other side in the case of original Xoom. The tablet is Wi-Fi only and is not with 3G connectivity. There is a very minute hiding blocked-up seems for the SIM or microSD cards. The Xoom 2 operates on Honeycomb. Multi-tasking is far simple in Honeycomb by a carousel showing all open apps. The web browser is clean and simple to use is fine for the utility of tabbed browsing. It is quite useful when it go for a massive and very elaborate browsing performance. Inside the slimmed-down body there is a dual-core 1.2GHz processor, matched up with 1GB of RAM. At the back side of Xoom 2 there is provided a 5- megapixel camera. The tablet lacking in, however soon be equipped with Ice Cream Sandwich give it more powered requirement.